Provided to GENUKI by the late Stan Waight and his team of contributors. Note: Most of the above files are large - typically 400-500 kbytes. Although the material from the censuses 1841-1901 is as comprehensive as possible, entries for service outside that period are not so. However, details from Establishment Books dating from the formation of the Coastguard service in 1822 are now available in the ADM 175 series at The National Archives. These may be downloaded from TNA, but the files are very large and the process is a very lengthy one. Indexes are being prepared - contact collest[at]btinternet[dot]com for details. Further, the records of seamen who joined the Royal Navy between 1853 and 1928 are now online at the National Archives website at http://www.nationalarchives.gov.uk/records/looking-for-person/royalnavyrating1853-1923.htm Coastguards are included in these records, and the initial search is free, but there is a charge for the downloading of an image of the record itself. A good history of the Coastguard Service is to be found in Coastguard! by William Webb, HMSO, 1976, ISBN 0 11 510675 8. At the beginning of his acknowledgments, Mr. Webb says: "The research for this book has been difficult because over the years the Coastguard has had many masters, and no continuous records have been kept ....". Indeed the protection of the Revenue (H.M. Customs & Excise), of the Realm (the Admiralty) and of Shipping (Board of Trade) have all been part of its duties for 200 years and more. The Service first acted as a Reserve for the Royal Navy during the Crimean War, and 3000 Coastguards were called up. In some of the less vulnerable sites, particularly in Scotland and in Wales, personnel would have been withdrawn temporarily during that period and its immediate aftermath. In particular, there seems to have been little Coastguard presence in Wales before 1871. More easily accessible is the National Archives Coastguard leaflet (Military Records Information 44), which is available online and gives the salient points of the Service's past. Members of the Service were normally recruited from the Royal Navy and early retirement was also the norm unless a man went on for promotion to Chief Officer. But it didn't do for Coastguards to become too well acquainted with the local people, and they were transferred quite frequently, movement taking place precisely during the period when the men were marrying and their families were being born (although this did not happen quite so much in Scotland in the early censuses, when men appear to have been recruited locally, and stayed in post throughout their careers). Furthermore, couples often settled in the last place of appointment on retirement, many miles from their places of birth. Keeping track of an ancestor and his family is therefore a particular problem if he was a member of the Coastguard. This becomes clear from the family details in the censuses, the places of birth of the wife and children giving an indication of appointments during a man's career, and the purpose of this project is to extract details of the complement of British Coastguard 'stations' at the time of the 1841-1901 censuses (service between censuses is often revealed by the places of birth of wives and children). 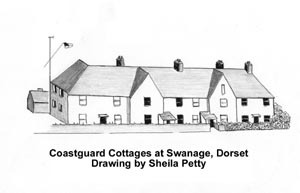 The use of the word 'stations' is not strictly accurate, because, until the familiar blocks of Coastguard cottages were built during the second half of the nineteenth century, personnel were dispersed in ordinary houses in towns or villages round the coast (several hulks were moored in the creeks of Kent, Essex and other counties to accommodate Coastguard men and their families). The project is a long-term one and will be updated from time to time as substantial numbers of additions can be made. It is thought that the final details of serving personnel could be rather better than 95% of the possible number. The researchers depend upon the personnel being correctly described, although men described as 'Navy' but with wives and/or children born in 'Coastguard' parishes often turn out to be Coastguard personnel . The transcription of men on pension has shown that they were frequently described as 'Greenwich Pensioners', but more frequently merely as 'Pensioners' or under an occupation taken up in retirement. Service in Ireland is outside the scope of this database, and, where men have not been found in any year, it is possible that they were serving there, but a site dedicated to the Coastguards who lived and worked around the Irish coastline between the 18th and early 20th centuries is to be found at https://www.coastguardsofyesteryear.org/news.php, and Aidan Power has considerable amount of information about the Crookhaven station). Where subsequent reference is to be made to parish registers, it should be borne in mind that a high proportion of the Service's personnel were Irishmen and Catholic. A 'Return of the names ....... Of all Persons now employed as Chief Officers of Coast Guard' was made to the House of Commons in 1857; this Return is in the process of being transcribed and will be included in this website in due course). The location of many Coastguard stations was established using the very-searchable Family History Research File of the 1881 census (the Church of Jesus Christ of Latter Day Saints). Further material has been gathered using a variety of sources off- and online (the Cornwall Online Census, FreeCEN and ancestry.com websites, and the Family Record Centre have been particularly useful and their use is gratefully acknowledged). The original schedules for the Scottish censuses were destroyed and individual details have been obtained by searching the ancestry.com website by 'occupation'; it is therefore probable that many individuals not described as Coastguards have not been found. The highest density of personnel was always on the Channel coast, particularly in Kent. Some stations cannot be found in the later censuses and may have been discontinued. Furthermore, men and their families were sometimes in lodgings at the time of a census, and it is possible that they had just arrived at a new location after transfer from elsewhere. Coastguard men spent periodic spells aboard HM ships on 'drill service'. The 1891 census for the battleship HMS Alexandria at Portland, Dorset, included 105 'Coastguardmen Borne for 10 days drill'. The census of 1881 shows 41 Boatmen at varous levels aboard HMS Penelope, enumerated at Harwich St Nicholas, and the complement of HMS Cambridge at Devonport included 9 coastguard Chief Officers. Stations are listed alphabetically in the References table, with sub-headings for England Scotland and Wales. Census references given thus - RG12/1645/100 - means Census 1891, Piece No 1645, Fol No 100. The Chapman County Codes have been used to identify counties and to facilitate electronic sorting. Although the surnames of wives and children have not been repeated, those of grandchildren and other relatives have been included to avoid doubt. Birth dates should be correct to one year depending on the actual month of birth, but they often varied from census to census. Where relevant additional material has been provided by visitors to this site it has been included in the tables, but no responsibility can be taken for its accuracy. It should be remembered that boundary changes may have taken place during the course of the period; for instance, Hampshire and the Isle of Wight were originally one county that stretched westwards to include Christchurch, and Gorleston, part of Norfolk in 1901, was part of Suffolk in earlier censuses. Every effort has been made to avoid errors, but some are inevitable in a project involving so much transcription - furthermore, original schedules may have been incorrect or errors may have occurred in intermediate transcripts. No independent checking has been carried out, but where errors or supposed errors have been found in the sources they have been corrected wherever possible (no attempt has been made to check Irish placenames). If they have not been resolved they have been indicated thus '(?)'. References for serving officers do not appear in the 'Locations' column but are to be found in the separate 'References' section. In some cases, separate locations such as those on Portsea Island, Hampshire, or those in Freshwater, Isle of Wight, are not easily identifiable from census to census and have been amalgamated. For technical reasons all apostrophes have been omitted from the database; for instance, the name O'Donnell will appear as ODonnell. The major collaborators in this project have been Roy Montgomery and Stan Waight (members of the Hampshire Genealogical Society), Bob Bartlett of Surrey (Dorset), Glenys Puxty (in depth material for Sheppey, Kent) and Mike Arnott. Sheila Phillips has kindly provided material from the 1901 and 1911 censuses for Ireland. Additional material has been provided by Barbara Chester (Pembroke), Wendy Cope (Glamorgan), Terry Leaman (Devon FHS) and John Lobb (Suffolk), and by Coastguard descendants who are too numerous to be mentioned individually. Steve Holden and Ivan Learmouth have kindly permitted extracts from their Isle of Wight projects. The involvement of several transcribers in the project results in some differences in the way the material is presented. This database should be treated solely as an index. Readers with Coastguard ancestors should check entries using the references provided when furthering their own research. Unfortunately, with the passing of Stan Waight, the Coastguards Project has come to an end and the project database is no longer being updated. These pages simply provide access to the final state of the database.